Third book in The Intergalactic Bed & Breakfast Series, published by Disney. 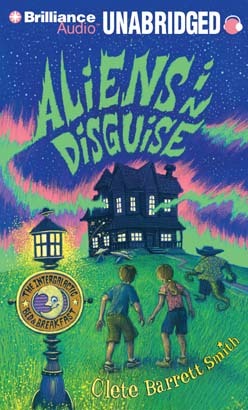 David is having the summer of his life at his grandmother's Intergalactic Bed & Breakfast, an inn for vacationing aliens. By now even the slimiest tourists don't faze him, and he has all of security officer Tate's safety procedures down pat. In fact, David thinks it's about time the grown-ups entrusted him and his friend Amy with even more responsibility. David and Amy get their big break when Grandma is invited to travel long-distance to accept an award and Tate decides to follow her. Running the B&B should be a breeze for two kids who saved the universe just a few weeks ago. But soon David and Amy are faced with some inconveniences, such as a lost alien, a pair of gate-crashers, and a potential horde of UFO-watchers descending on the inn. In other words, it's an ordinary day. Check in to the Intergalactic Bed & Breakfast for another kooky comedy featuring an assortment of hapless humans and awesome aliens.